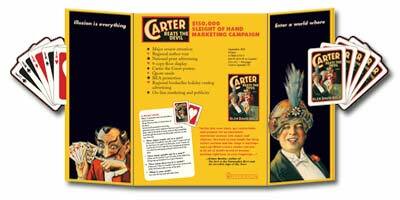 At left, folded, is a brochure for Carter Beats the Devil by Glen David Gold done for Hyperion Books. 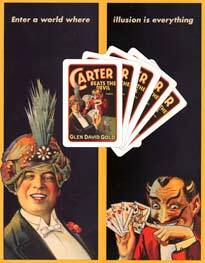 It features a gate fold with a die cut around the deck of cards. Below is the flat sheet. 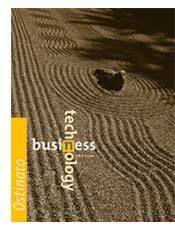 Die cuts, foils, embossing, 6-color printing, can all make a product look absolutely terrific. Yet, the skilled designer can make 2-colors look fantastic as well. The Ostinato brochure is a 2-color project, using PMS 130 orange and black. It consists of one stock image, converted to a duotone in Photoshop, cropped showing different details, and a playful use of color in the type. 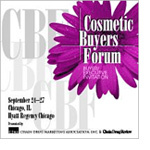 The 2-color Cosmetic Buyers Forum 3-panel, letter-fold brochure was co-produced with CM Communications for the Chain Drug Marketing Association. Whatever your budget, we can find a design solution to fit your needs.